Not to be confused with Sewart Air Force Base. For the civil use of this facility, see Stewart International Airport. Stewart Air National Guard Base is the home of the 105th Airlift Wing (105 AW), an Air Mobility Command (AMC)-gained unit of the New York Air National Guard and "host" wing for the installation. The former Stewart Air Force Base is also known as Newburgh-Stewart IAP and Stewart International Airport, while the military portion of this now-joint civil-military airport is known as Stewart Air National Guard Base (Stewart ANGB). The base is named in honor of 19th-century Scottish-born sea captain, Lachlan Stewart, and his son, who donated the land it now occupies. Located in the Town of Newburgh, New York. The 105th Airlift Wing's mission is to provide peacetime and wartime inter-theater airlift operations using the Boeing C-17 Globemaster III. 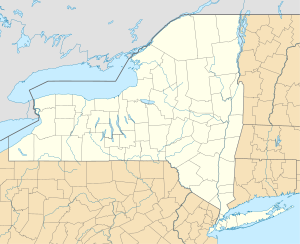 Newburgh is approximately 60 miles (97 km) north of New York City, NY and 100 miles (160 km) due south of Albany, the capital of New York State. The air national guard base encompasses 267 acres (107 ha) and contains 36 buildings, amounting to approximately 757,000 square feet (68,130 m2). There is no family or transient military housing, with military personnel residing outside of a 50 miles (80 km) radius normally being billeted in nearby hotels and motels under military contract arrangements. The day-to-day military population of Stewart ANGB is approximately 660 full-time Air National Guard personnel, both Air Reserve Technician (ART) and Active Guard and Reserve (AGR) personnel, plus approximately 150 additional active duty Army, AGR Army Reserve and AGR Army National Guard, active duty Marine Corps and Active Reserve Marine Corps personnel. This is further augmented on a daily basis by a fluctuating number of over 3,000 additional traditional, part-time Air National Guard, Army National Guard, Army Reserve and Selected Marine Corps Reserve (SMCR) personnel. Because of the operational flying missions, most of the personnel of the Air National Guard, the Army National Guard, the Army Reserve and the Marine Corps Reserve are funded for, and perform, additional military duty in either a drilling status or an active duty status far in excess of the typical ground-based reserve or national guard unit. For example, on at least one weekend each month, the 105 AW's population surges to over 1,600 personnel in response to the monthly required Air National Guard unit training assembly (UTA), attended by nearly all of the 105 AW's personnel. In 1988, the United States Marine Corps became a tenant of the Stewart ANGB with the establishment of Marine Air Refueler and Transport Squadron FOUR FIVE TWO (VMGR-452), along with Marine Aviation Logistics Squadron 49 (MALS-49) and Marine Aircraft Group 49 (MAG-49), Detachment Bravo. A Marine Corps Reserve unit of the 4th Marine Aircraft Wing, VMGR-452 has operated KC-130T Hercules aircraft available for worldwide tasking in support of Marine Expeditionary Forces and combatant commanders and is transitioning to the KC-130J Hercules. Stewart Army Subpost and the Stewart-Newburgh Armed Forces Reserve Center are also located on Stewart ANGB. The former supports the U.S. Military Academy, the 1st Battalion, 1st Infantry Regiment (1-1 INF BN) and the UH-72 Lakota-equipped 2nd Aviation Detachment (2ND AVN DET), while the latter supports the consolidation of several smaller and obsolescent U.S. Army Reserve Centers and New York Army National Guard Armories throughout the Hudson River Valley, colocating their associated units at a single site with modern training facilities. The U.S. Army Reserve also maintains the Stewart-Newburgh Armed Forces Reserve Center on the installation. In November 2010, it was announced that the Air Force had selected Stewart ANGB as its "preferred base" for eight C-17 Globemaster III jet cargo aircraft slated to be operated by the Air National Guard for the Air Mobility Command, with the twelve C-5A Galaxy cargo aircraft operated by the 105 AW at the base to be retired and replaced by the C-17s. In March 2011, Air Force officials announced that the 105 AW had been chosen as the final basing decision for eight C-17 Globemaster III mobility aircraft. The 105 AW's first C-17, AF Ser. No. 05-0105, arrived in July 2011 and the wing commenced retiring their C-5 aircraft and transitioning to the C-17. This transition was completed in September 2012 with the departure of the wing's last C-5 aircraft. ^ "FindArticles.com - CBSi". findarticles.com. Retrieved 4 May 2018. ^ 105th Airlift Wing, New York Air National Guard - History Archived 14 February 2013 at the Wayback Machine. 105aw.ang.af.mil. Retrieved on 2013-09-18. ^ 105th Airlift Wing, New York Air National Guard - Media Gallery Archived 19 February 2013 at the Wayback Machine. 105aw.ang.af.mil. Retrieved on 2013-09-18.